South Africa's police are under pressure to provide answers after officers gunned down 34 mine workers in scenes reminiscent of a darker past. Some say their actions were unacceptable, while others say they were justified and even inevitable. Despite South Africa’s police commissioner insisting it was “no time for finger-pointing”, the recriminations have already started to fly. A day after Commissioner Riah Phiyega’s officers killed 34 striking workers and wounded 78 others during protests at a platinum mine in Marikana, northwest of Johannesburg, South Africa wants answers. Phiyega’s insistance that her officers acted in self-defence against armed miners has failed to stem a torrent of criticism aimed at her force in the wake of Thursday’s bloodshed. TV images showing a line of police firing indiscriminately into a crowd of workers has shocked the nation and stirred up some painful memories of the apartheid era. "THE CRITICISM OF THE POLICE IS COMING FROM CIVIL SOCIETY AND THE AFRICAN NATIONAL CONGRESS YOUTH LEAGUE"
“Bloodbath”, “Killing Field” and “Mine Slaughter” were just a selection of the headlines in South Africa’s press on Friday. The South African Institute of Race Relations (SAIRR) joined newspapers and commentators in recalling the infamous 1960 Sharpeville massacre, when police, then answerable to an apartheid government, opened fire on black protesters and killed 69 of them. On Friday, the SAIRR called for an “immediate suspension of all police officers involved in the shooting, pending charges of murder or culpable homicide”. The build up to Thursday’s tragedy meant tension was understandably high among police ranks. Even before the first bullet had been fired, 10 people had already been killed in a conflict between rival trade unions. 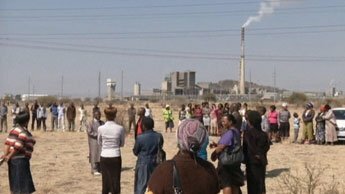 The labour dispute began on August 1 when workers staged a walk-out demanding better pay from Lonmin, the London-based company that runs the mine. Among those victims were two police officers, hacked to death by striking miners, who had armed themselves with machetes, spears and even firearms. But even if provoked by the killing of their two colleagues, “no disciplined and properly trained policeman would shoot into a crowd,” SAIRR argued. The institute’s research manager Lucy Holborn told FRANCE 24 the deaths at Marikana were due to the failed strategy of a poorly-trained, ill-disciplined police force that has been riddled with allegations of corruption and bribery. “The ability of the police to maintain law and order is being brought into question,” said Holborn, who believes the force’s general inability to bring perpetrators to justice, meant they had failed to stamp out the violence that still plagues the country. Others, equally outraged by Thursday’s events, went even further in their criticism. Helen Zille, leader of the opposition Democratic Alliance, called the shootings a “massacre”. For Jeff Mphahlele, secretary general of the Association of Mineworkers and Construction Union, the Marikana killings were simply an act of retribution. “The police had planned everything. It was planned right from the top. They killed innocent people,” he told Radio France Internationale (RFI). Not everyone in crime-ridden South Africa has lined up to place the blame for the miners deaths at the door of the police, who only fired live rounds after tear gas and rubber bullets had failed to disperse the crowd. On Friday, Zuma announced he had set up an inquiry to “find the truth and learn the lessons” of the “shocking” events. Reports that miners were sharpening their weapons and licking the blades of machetes whilst chanting war songs meant the police would have been acting under extreme pressure and provocation, said Johan Burger, a senior researcher at South Africa’s Institute for Security Studies. “This was no ordinary crowd management situation,” Burger told FRANCE 24. “The police were dealing with a crowd, who were angry and heavily armed. Some even had the firearms from the policemen they had murdered just days before. “You can imagine what was going through their minds after they had seen the mutilated bodies of colleagues who had been hacked to death. It would have had a huge psychological impact on them,” Burger said. For Burger, Thursday’s events were predictable in a country where violent protests have become a regular occurrence in recent years. According to the South African Police Service, there were 622 crowd management incidents in 2004/05 where the police used force to intervene. By 2011/12 that number had shot up by 75 percent, to 1,091 cases. For many, these protests and the ensuing violence represent the growing resentment of people living in a country crippled by poverty and vast inequality, and where unemployment stands at 25 percent. There has been widespread resentment and disillusionment at the failure of the ruling ANC party to bring about change 18 years after the end of apartheid. There is also anger at the levels of corruption described as ‘endemic’ by the country’s Public Protector, Thuli Madonsela. When peoples’ frustration bubbles over into unrest and violence, it is the country’s police force that naturally ends up on the front line. South Africa’s successful hosting of the 2010 World Cup had convinced many that the country’s reputation for violence and murder was unjust. But the images of young men lying in pools of blood after a labour dispute had turned ugly proves South Africa still has a long way to go before it rids itself of the curse.